Recruitment are 66 posts. Age of the candidates should be 21 years to 30 years as on 25th November-2017. Contractual period will be from 6 months to one year from the date of joining. Interested applicants with eligible criteria are required to go through the NIMHANS institute website http://www.nimhans.ac.in/. Read the general terms & conditions and download the application form. Submit the prescribed application with age proof, qualifications, registration certificates to the Registrar, NIMHANS, Bengaluru, India. Last date for the application registration is 25th November-2017. Selection of candidates will be based on candidate merit in educational qualifications (BSc Nursing Course). After selection candidates will be offered consolidated monthly stipend of Rs. 12,000/-. 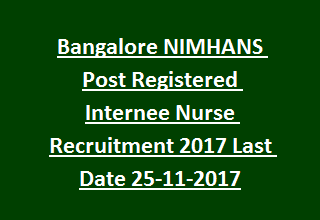 Further information related to National Institute of Mental Health & Neuro Sciences NIMHANS Recruitment Post Registered Internee Nurse Vacancy details, pay scale, application procedure, Selection method other description are mentioned below. Total available vacancies in National Institute of Mental Health and Neuro Sciences NIMHANS Recruitment are 66 posts. Total no of vacancies: 66 posts. Consolidated stipend for the post Registered Internee Nurse is Rs. 12,000/- per month with free hostel accommodation. Applicant should have minimum age limit is 21 years and maximum age limit is 30 years. Cut off date for age limit is 25-11-2017. Minimum educational qualifications for the current recruitment vacancies is B.Sc Nursing with registration in Nursing. Please go through the NIMHANS notification for more qualification details. NIMHANS Recruitment selection is based on candidate merit in academic qualifications (aggregate marks in BSc Nursing course). Candidates with all essential qualifications, are advised to go through the NIMHANS institute website http://www.nimhans.ac.in/. Download the application from the institute website. Read the general conditions and submit before last date. Attach the requisite documents of age proof, registration certificates and qualification certificate with the application form. For more details see the notification.